Up at 1:30 am and on the road smsing Christopher at 2:10am. 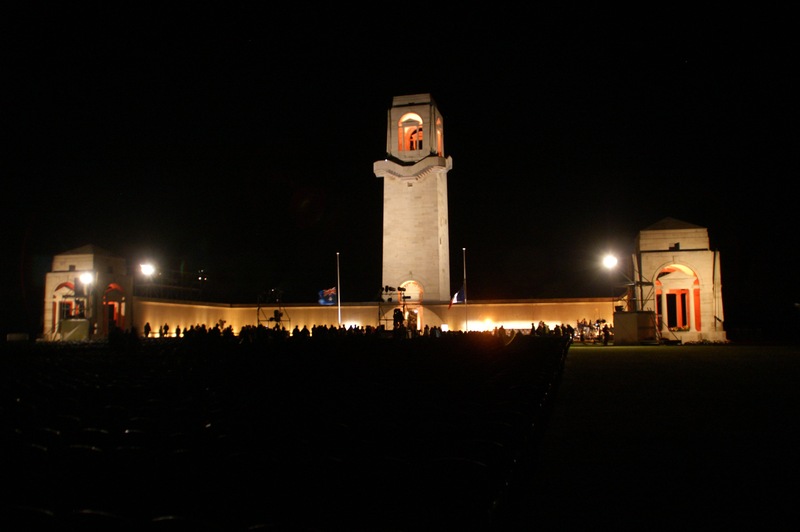 Am very proud that he and his mates got up early and attended the dawn service in Melbourne, in the cold and the wet. Here it is currently 3°C and only going to get colder before the sun rises this morning. Yannick has done a lot of research on how to get to the venue, and we arrive in Villers-Bretonneux park the car on the street so that we can see if the navette (shuttle bus) is circulating. This wasn’t mentioned on any of the sites that I had visited, and is put on by the local tourist authority. Some fellow Aussies pull over to see if this is the right place to catch the bus, and we tell them we believe so (they found out about it from the Tourist Office). We are lucky as we only had to wait about 5 minutes until the first two buses pull up. On board, it is obvious that we are on the first run, as the driver has to explain to the Gendarme at every turn, that we are “Navette, navette”. When we arrive on site, we are met by Airmen and women, one fellow said, just leave your ten euros each over there! Typical Aussie humour. We spend a while chatting, before we head up toward the memorial, through the cemetery. There are television trucks everywhere and the memorial is lit up beautifully. Everyone receives a program, French/Australian Flag badges and ponchos just in case it rains. When we get up to the seating, (Yannick calculates that there is seating for at least 4,000), we are lucky enough to get seating in the row just behind the seating set aside for the dignatories, special guests, and those with special needs. The good thing about this seating is that it is also the beginning of the section and there is about a six foot space between us and those seated in front, the other good thing is that it is out of the wind. We now have to wait about two hours until the ceremony commences at 5:30am. The crowds begin to grow and everyone is in good humour, although it is freezing. The seats are damp, but they have someone going around and wiping them down, we place our rain ponchos over the seat to keep them dry. At the moment, it is far too cold to sit down, so we stand and move around, stamp our feet, move our arms, and chat to those around us. Eventually a WA school band move into place, and the pre-ceremony proceedings get under way. The music begins with music of the era such as “It’s a long way to Tipperary” some other golden oldies, and then moves to more solumn notes as time for the ceremony to commence approaches. A lady from the Australian Navy sings, she has a very strong beatuiful voice. Preceding the ceremony a number of young Australians read out the names and details of twenty young Australians who lost their lives in WWI. After this there is silence until the ceremony, proper, begins. Jusst an aside,I now have to add that I am wearing two pairs of trousers, two pairs of socks, big heavy (normally warm) walking boots, two long sleaved tops, a heavy hooded jumper, a hooded jacket, a scarf, gloves and a hat. AND I HAVE NEVER, NEVER, NEVER, NEVER, NEVER, BEEN SO COLD IN ALL MY LIFE!!!!!!!!!!!!!! The ceremony is in English, and in places is also in French. It is attended by dignatories from both Australia and France, from a local and national level. There are also representatives of other countries in attendance. I personally found that the most emotional time for me was at the conclusion of the ceremony as we were walking away, thinking of Grandpa, and the fact that I was wearing his medals, back where he went into battle all those years ago. I was also honoured that I could wear my own service medal at the same time. We had decided that we would walk out as there would be a long queue of people waiting for the navette. The path out was well marked along the road, and the lights were still on, even though the sun had now risen. Yannick, fronted up to one of the lights which was run on a generator to warm his hands from the outlet of the generator. After a bit I got a bit worried, I looked at Gary and he was looking very grey. When I asked if he was OK, he said he was freezing, he didn’t look well. So quickly took my scarf off and wrapped it around his neck and ran from side to side rubbing his gloved hands to try and get him warmed a little. Back at the car, we grabbed the basket from the far back, piled in and poured tea and coffee for all, and for those that can, beautiful little chocolate chip dotted Brioches. Very much needed and greatly appreciated. We had planned to stay and attend the ceremony at Villers-Bretoneoux, however it was decided that we need to get Gary warm and feeling better. So headed toward Amiens, where we found a coffee shop and settled in for coffees, hot chocolates and a toilet break! The chap that served us notes the medals, poppies, Australian badges etc, and starts a conversation with Veronique, he has attended the ceremony previously and they discuss where we will be going tomorrow, where he has also worked. He appears to be a really nice lad, so I scratch around in my bag for a little Kangaroo. Everyone is very amused by all the little souvenier animals that I pull from my bag! I show Veronique the Koala key ring I have hanging from my bag , and she loves it, but she loves Kangaroos much more, so I manage to find one of them for her, then I find the little Kangaroo that I was looking for, and as we leave I hand it to the lad, for which I promptly receive a Merci beaucoup madam and a kiss on each cheek. Gary comments to Veronique and Yannick that I manage to find some eye candy whenever we are in France! Our main reason for coming to Amiens is to visit the cathedral, which is massive and was built over many centuries, thence the various styles of architecture. It is a beautiful cathedral and we spend quite a lot of time wandering around.